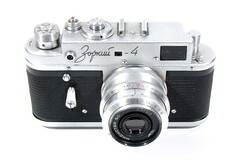 Zorki ( Зоркий, meaning "sharp-sighted") is one of the most widely known Soviet photo brands. 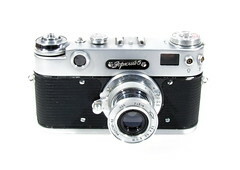 It was one of two USSR efforts to produce rangefinder cameras derived from the Leica design. 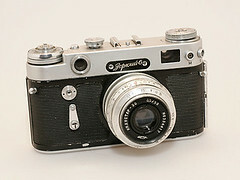 During WW2, The Soviet camera factory FED was evacuated to escape advancing German troops. 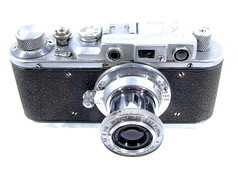 After the war, FED had troubles resuming production of their FED-branded rangefinder camera, (a copy of the pre-war German Leica 35mm camera). 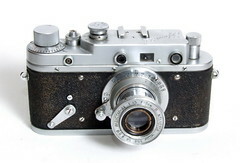 Because the KMZ plant had escaped destruction, that company started making the FED camera under a joint FED-Zorki logo in 1948. 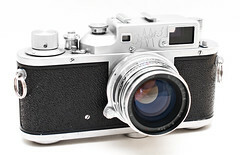 When FED got back in operation, KMZ continued to produce rangefinder cameras under the Zorki trademark (inlcuding export models), and made design changes diverging from any Leica influence. Other cameras produced by KMZ include the Moskva series of 6x9/6x4.5 folders, the Drug rangefinder and the Iskra 6x6 folder. 3/8" 3/8" 3/8" 3/8" 3/8" 3/8" 3/8" 3/8" 3/8" 1/4" 3/8" 3/8" 3/8" 3/8" or 1/4" 3/8" or 1/4" 1/4"
This page was last edited on 13 December 2017, at 01:12.